When classes are rough, sometimes the weekend just doesn’t come quickly enough. If you’re looking for some entertainment to get you over the Monday morning hump, check out any one of these popular Penn State bars. Central Pennsylvania has a bustling country music community, so every Thursday on Country Night, Pickles becomes one of the most crowded bars downtown. The bathrooms are almost always spotless, and its high ceilings mean you won’t be sweating bullets all night. They’ve got damn good wings, too. 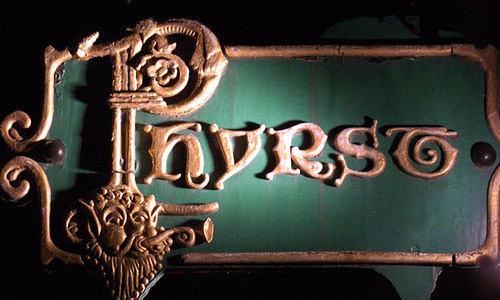 On the opposite side of the spectrum, the Phyrst is a dark, grungy basement dive known for their cheap drinks and long lines. Business Insider rated it one of the top 31 college bars in the country, and its iconic name draws a mixed crowd every weekend, from alumni to seniors. At least once a week there’s a patron way too old to be that drunk. The Phyrst hugely supports local artists too, so expect live (and hair-raisingly loud) performances almost every night from State College’s own cover bands. One of the oldest dives in town, Saloon’s biggest draw is their karaoke night, when all the inebriated bar-goers get up on stage and holler their lungs out incoherently while spilling their drinks. It’s a guaranteed laugh and a loose environment, and Saloon’s strong drinks will keep you feeling giddy no matter how silly you look on stage. Despite their rainbow-hued logo, Chumley’s isn’t just a gay bar. It’s a bar that’s open to all kinds of people and doesn’t tolerate any discrimination of any kind. The room isn’t huge, but most Penn Staters prefer to describe Chumley’s as “intimate.” There’s no other place downtown where you’ll feel more welcome and comfortable. Café is one of the only places in town where you can drink outside. At any time of day, there’s sure to be a few dozen people sharing a pitcher under the green umbrellas. It’s also one of the biggest bars in State College, with four separate areas -– two outdoor – to get sloppy in. Local rock groups occupy the wide stage on most nights (with cameos by owner and guitarist JR Mangan himself), and Café’s spaciousness means there’s always room on the dance floor to groove. Featuring a different DJ every night, Indigo is one of the few nightclubs in State worth visiting. On weekends the joint is packed wall-to-wall, but the Thursday night crowd is a little more bearable (though no less sloppy). With flashing lights, thumping music and sweaty, bobbing dancers, Indigo is the spot to go if you’re looking to dance until your legs are numb. For you hops enthusiasts, Zeno’s Pub has one of the most expansive draft selections in State College. Between bottles and tap, they have dozens of brands for you to peruse, from Dogfish Head and DuClaw to Rochefort and their own Rye brew. They have nightly live entertainment too, including an audience trivia night, and their food menu is nothing to scoff at, with plenty of greasy but well-made grub to sate your drunk munchies. Beer and burritos are a match made in heaven. But beer, burritos and margaritas – well, that’s the Holy Trinity. Mad Mex is one of the classier Mexican food spots in town, blowing Chipotle way out of the water because their menu includes inexpensive drinks. Their burritos are larger than your head (and half-price during Happy Hour! ), so you never leave sober or hungry. They’re strict about underage drinking though, so don’t expect your tried-and-true fake ID to get you in. Dimly lit and smoky with a perpetually cool ambiance, Chrome is your quintessential hookah lounge. Lie back and decompress on their comfy couches, but don’t show up in jeans and a t-shirt or you’ll look out of place. Their refined Mediterranean-based menu features well-made drinks and delicate appetizers like smoked salmon rolls and tomato bruschetta. They also, of course, have a wide selection of hookah flavors.